In September of this year, we tweeted – "The motorcycle industry needs a feel-good movie of the decade.” In October we received word one was coming down the pipe. On Any Sunday was the finest feel-good motorcycle movie of the 20th century. It dispelled all the illusions Hollywood had been painting with bad boy films starting with The Wild One and working their way into Easy Rider and all points in between. On Any Sunday showed a lighter side of riding including racing and family lifestyle. It essentially backed up the "You Meet The Nicest People On A Honda” campaign forged by Honda in the late 1960s. 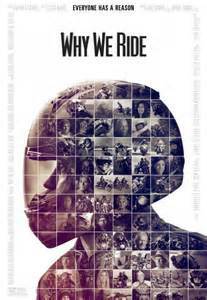 And it created an entirely new market of motorcyclists converting non-riders to riders within 90 minutes as a result of its successful theatrical release. Following On Any Sunday, Hollywood took a left turn and brought more bad boy and b-roll motorcycle movies to the market like Mad Max, Any Which Way You Can, Biker Zombies and Wild Hogs. Fortunately in 2005, Hollywood scored with two pro gems in Dust to Glory and The World’s Fastest Indian – both feel good films focused around racing but centered on lifestyle. Not the 1% lifestyle, but the other 99%. 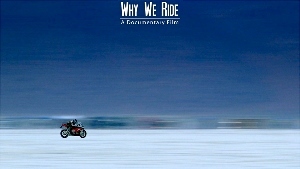 Movies like these can draw a non-rider to the riding side when they get a true taste of what riding is really all about. Ask any dealer how business is and you’ll see that our industry is hungry for another score. Producer James Walker along with Director Bryan H Carroll (Titanic, Collateral, Miami Vice) holed up in a home studio outside of Hollywood creating and piecing together a modern-day documentary aimed at non-riders. By staying detached from Hollywood, the pair felt it more conducive to making the movie they wanted to make, not one Hollywood would prescribe. 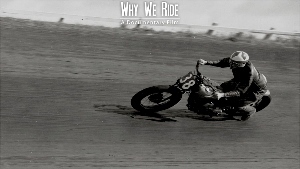 The result – Why We Ride - 90 minutes of documentary narrated only by the interviewees themselves. Some of the interviewees are unknown, while others are stars in their own right including Mert Lawwill, Troy Lee and Valerie Thompson. Indeed the movie shows the 99% diversity. After all, real riders know that in motorcycling there is not a single lifestyle type - that’s just what Hollywood has fed people in mass for 65 years, but in fact there are many sub sets. The goal here is to reach the non-riders. But the initial marketing push has not accomplished that. A limited-screening-only model was pushed to dealers and organizations in the fall, resulting in riders who found out word-of-mouth about the events. Missed? The 95% of the population who do not ride. Then the pair arrived in Long Beach for the International Motorcycle Show for a special Q&A onstage in December. Again reaching the riding population and skipping over the 95% intended audience. Within 60 days of the first screening, the DVD became available, essentially nixing any possibility of a full theatrical release. Without such a theatrical release, the 95% non-riding population will miss out on hearing about the documentary. If you own a copy of On Any Sunday, Dust to Glory or the World’s Fastest Indian, this is a must-add to your movie collection. 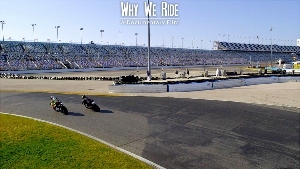 But more importantly, it’s a must-show DVD to share with friends and relatives who do not ride. Consider holding a movie night at your home and share this modern day work with as many non-riders as you can seat in your living room. Those who enjoy it will probably want more, so make a promise to show one of the other three aforementioned feel-goods next month, or just move into double-feature mode right then and keep the good times rolling. 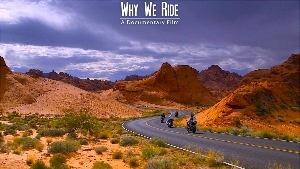 Why We Ride is available from better dealers or click here to order your copy now.